User experience designers spend a lot of time observing users, talking to them, and gathering feedback. They track metrics like load time, crashes, and daily active users. These experiments and numbers are invaluable for creating an effective UX — but they’re not enough. You need a holistic view of the overall user experience to make good product development and UX decisions. That’s the question the UX Research experts at Google faced. The result? 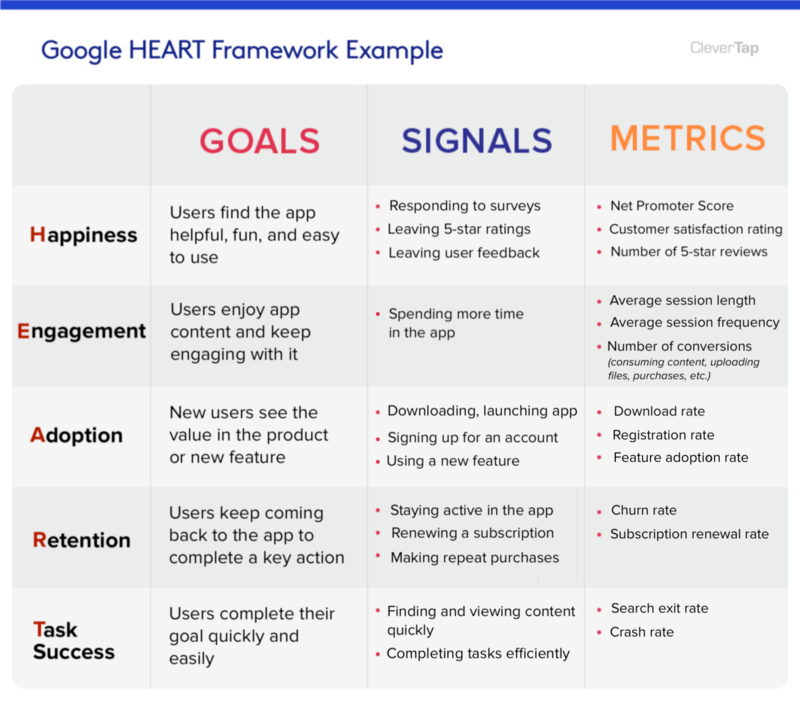 The Google Heart Framework, designed to help UX teams focus on specific aspects of the user experience they want to improve, as well as identify concrete goals and user experience metrics to gauge success. What is the Google Heart Framework? The HEART framework is a set of user-centered metrics. It was developed to evaluate the quality of the user experience, and help teams measure the impact of UX changes. Happiness: How do users feel about your product? Happiness is typically measured by user satisfaction surveys, app ratings and reviews, and net promoter score. Engagement: How often are people coming back to use the product? Engagement can be measured by number of visits per user per week, session length, or a key action, like the number of photos uploaded or songs listened to per user per day. Adoption: How many people complete the onboarding process and become regular users? Adoption is measured by number of new users over a period of time or percentage of customers using a new feature. Retention: What percentage of users are returning to the product? Retention is measured by churn. Task success: Can users achieve their goal or task quickly and easily? Task success is measured by factors like efficiency (how long it takes users to complete the task) effectiveness (percent of tasks completed), and error rate. The HEART framework can be applied to a single feature in your app, or to your whole product. Download the Google Heart Framework PDF worksheet to get started with user-driven UX metrics. We’ve emailed you the worksheet! Setting goals up front is a great way to get every member of your team on the same page. Is it more important to attract new users, or increase engagement for existing users? What tasks do you want new users to complete? Remember that goals for a particular product or feature update may be different than the goals you have for your overall app. It’s important to narrow down your list of goals to no more than 3. While focusing on every aspect of the HEART framework may seem like a good way to build a near-perfect UX, it’s not practical to be juggling five goals and more than a dozen metrics. For example, if you want users to talk about how easy your app is to use, focus on task success. If you want them to talk about how much they enjoy using your app, choose happiness. Every goal has related user actions. Mapping your goals to those actions can let you know whether you’re on track. What behaviors or attitudes would indicate your goal has been met or failed? For example, entering search text but not clicking on any of the results could indicate irrelevant results. Or an increase in time spent consuming content in the app would indicate higher engagement. Finally, distill signals into trackable metrics that you can monitor in a real-time dashboard. For happiness, Net Promoter Score or Number of 5-Star Ratings would be a trackable metric. For adoption, Registration Rate may be a good metric to watch. It’s easy to generate a lengthy list of potential metrics. Keep your list manageable by sticking to metrics that will actually help you make UX decisions. Kerry Rodden, one of the original Google UX Researchers who originated the HEART framework, mentions an important consideration. * Your overall numbers will naturally go up as your user base grows, so make sure you normalize results. Ratios, percentages, and averages per user are more useful than raw figures. CleverTap makes it easy to implement the HEART framework and improve your app’s UX. Display personalized in-app surveys, rating and review requests, and tooltips to increase user adoption, retention, and engagement for every user segment.